Thank you for visiting the home of beautiful knitting patterns for high quality doll clothes; the doll-knitting-pattern site. Hi, my name is Kjell. My task is to shoot all the photos, publish the patterns, mananage the system and the cooperation with Payloadz (the netshop), send the newsletters to you and ensure the proper functioning of this site.. I am happy to introduce to you Maalfrid Gausel. 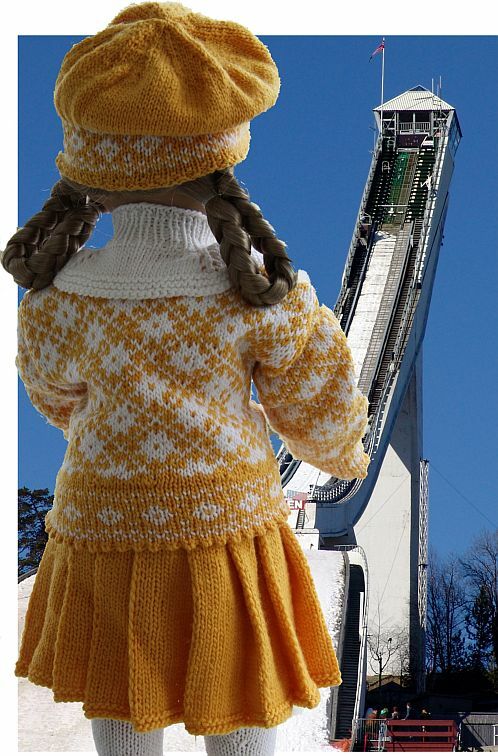 Maalfrid is a "doll clothes knitting celebrity" in Norway. 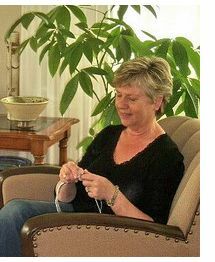 In fact she is the doll-knitting-Queen of Norway. She has published five popular knitting books, here are the first four of her books filled with delightful doll clothes knitting patterns, new editions are now reprinted in large numbers, however the three oldest ones are out of print. These books are unfortunately written only in the Norwegian language. For the purpose of this site she will design quite new collections based on traditional Norwegian high quality clothes blended with a more modern style. My name is Bettina, and I am living in Germany, at the border of Black Forest. Here I am staying with my husband, our daughter and 35 tortoises in a little town, with ca. 3000 people in it. Hello and thank you for visiting us. I am living at the beautiful south-western coast of Norway, near by the town Stavanger. My first name, Målfrid, contains one of the three special Norwegian letters. You pronounce "å" like au in Paul: Maulfrid. The feedback on my four books has been a little bit overwhelming. I get nice calls from all over the country. It seems like my books bring joy and inspiration to many people. 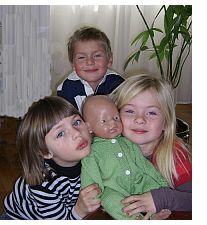 Since my doll knitting pattern book number four was finished I have been thinking of what to do next. International publishers have asked me to publish my books. However, one day Kjell called me and asked; "Målfrid, why not spread your doll clothes patterns world wide using the best way to do it; through the internet." Yes, of course, that's an exciting idea. So here I am. Yarn and knitting, and knitted doll clothes, - have fascinated me as long as I can remember, and through many years I have created a lot of knitting doll clothes models. Designing and knitting give me such joy. My love for colors, texture and fibre is something that has been with me as long as I can remember. I have designed some hundred doll clothes models, and often people ask me how I get it all done. I think one of my keys to success is getting up early in the morning and good time management. However, ideas for new patterns come to me while I'm working on other tasks. of course from my love for my grandchildren. I am the grandmother of Malin and Karoline, Kaja, Fredrik, Tiril and Mons. Karoline and Malin often visit me bringing their dolls with them, so one day I wanted to refresh old memories and knitting skills. I found my knitting needles and yarn of thin, soft wool and began to knit doll clothes which looked the same as the doll clothes I used for my own dolls as a little girl. The results made the girls very happy! They got new knitted doll clothes for their dolls, and it was always exiting and great fun for them to see what grandma, in a magical way, was able to create with a ball of wool and her knitting needles. Since then my life, my home, has been filled with knitted doll clothes. So I started, and little by little I have designed many different creations. From adults who are collecting old dolls I have received many enquiries about knitting models. Many of them have been looking for classic clothes fitting these dolls. Unfortunately it has been difficult to find knitting patterns for doll clothes. I've often had to improvise by adapting baby clothes patterns. Sometimes I've even had to design the patterns myself. Not everyone sees this as an easy thing to do, most people need to use a pattern. I will focus on American Girl doll and Baby born knitting patterns. The size of those dolls fit a other 18" dolls too. I look forward presenting my new collection. Some of it will be in a more modern style and some of it in the style of Norwegian and Scandinavian traditions. 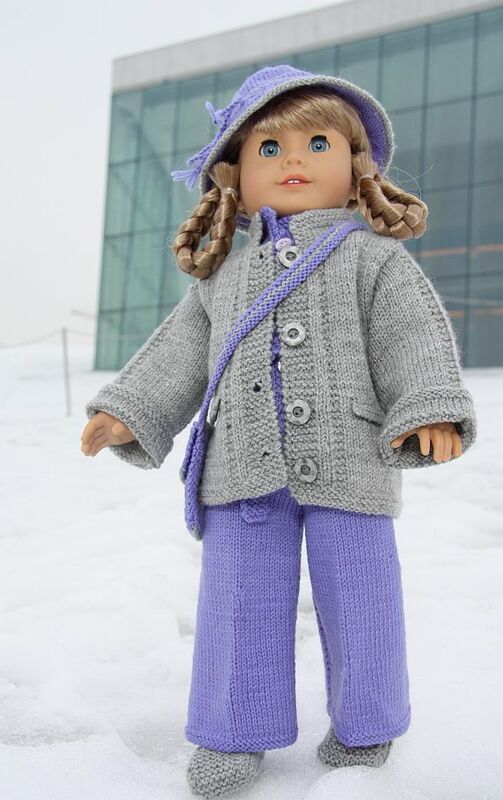 A lot of people in Norway love to knit doll clothes, and they put the results of their knitting on their web sites and blogs. Monai has knitted some doll clothes based on my doll knitting patterns, and she show her pictures of good work on this website. Later on I would love to invite visitors who have knitted doll clothes using my knitting patterns to upload photos of their creations.